Hydrogen is a powerful virtual drum machine. It is an open source software, free available for Linux, Windows, and Mac but Intel based. Come across a software dedicated to a specific instrument, which is also of good qualities and free is not very simple. Many times I’ve utilized VST or plug-in which require others software or sequencer to run. Hydrogen is a virtual drum machine which works alone, and has a libraries of samples and patterns. Adding to this that it is free, open source, and without limits. Download Hydrogen through the official site. A screen shot of Hydrogen GUI. What the main features of this software? First, has a good GUI, simply and essential, with no-frills.Then, it has samples of excellent quality to obtain interesting final results. In fine, Hydrogen can be played with yuor Pc keyboard, interfaced with an external Midi controller or linked to a sequencer software as Cubase. 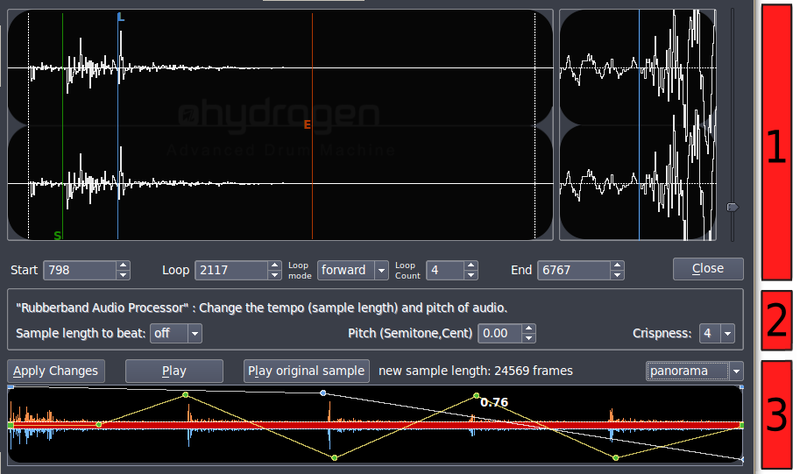 Hydrogen allow you to generate rhythmic patterns to be used as accompanying for your performances. Hydrogen isn’t only for computer-based compositions, I’ve seen many musicians replace the metronome with this powerful drum machine to give more realism to their private performances. 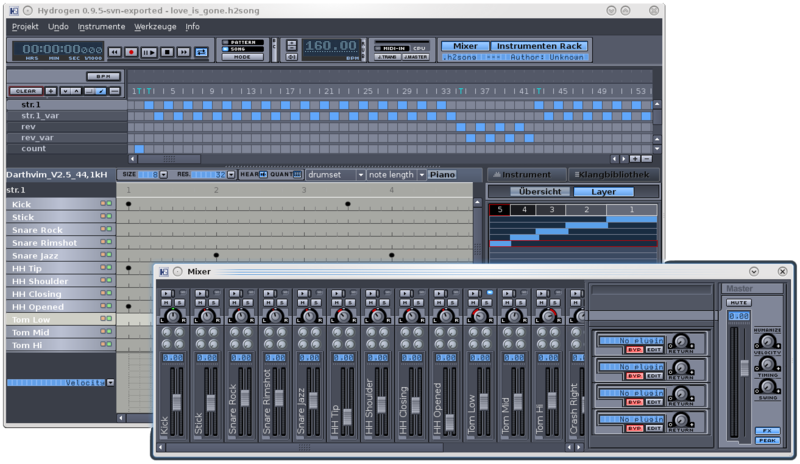 Hydrogen has four main windows: Song Editor, Pattern Editor, Sample Editor and the Mixer. There is also another GUI that is the classical Main Toolbar, which include buttons like Play, Stop, Record and so on. The Main Toolbar with many commands and indicator lamps. 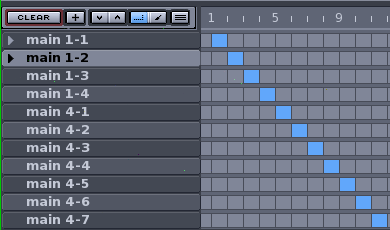 The Song Editors allows you to organize the overall composition. Indeed, every blue rectangle indicate one pattern, composed by one or more bars. It could be a verse or a refrain or that what you want. In this window you can arrange all the patterns to obtain the overall form. The Song Editor window. Every blue rectangle indicate a single pattern. Each of them can be moved, copied or eliminated easliy. In Song Editor we can create new patterns. So, a new window activates called Pattern Editor; where we can also modify those already generated. The Pattern Editor GUI. On the left used samples, at the center the writing grid. The pattern editor has a more essential GUI. Clicking on SIZE we indicate the bars number, notes duration and, in particular, instruments used. On the left, indeed, we have the samples list: snare drum, hit-hat, bass drum, crash and so on. 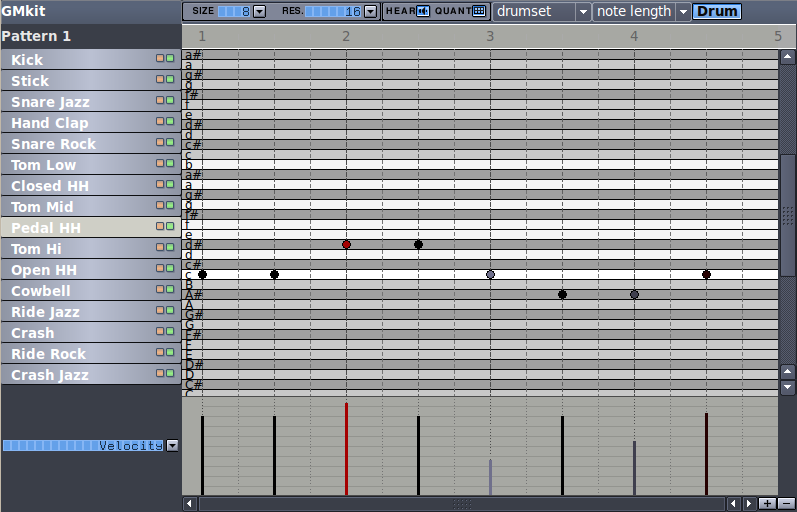 On the center, the grey area, allows to insert a note in a grid which cross instruments with the beats of every bar. Down you can see a drop-down menu by which select a particular parameter: Velocity, Pan, Lead/Lag and Notekey. 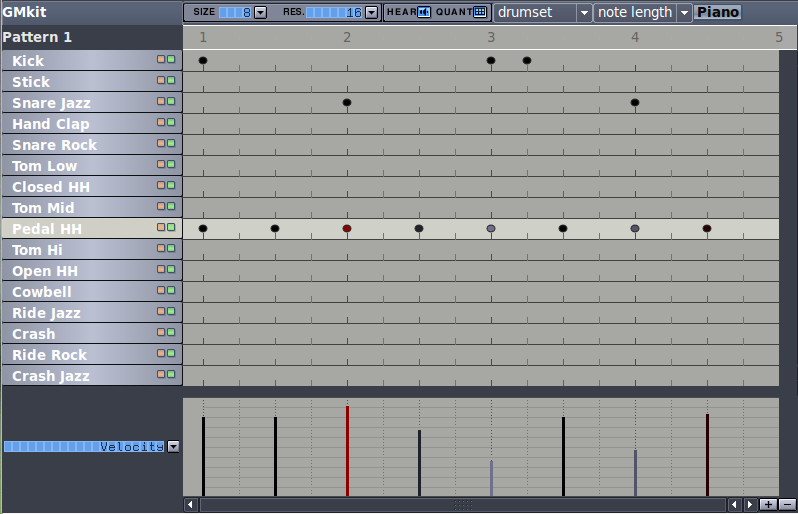 The pattern editor can be used through two views: Drum and Piano. The previous picture is in Drum mode, while the following in is Piano mode. The Pattern Editor in Piano mode. Different views but the same features. In Drum mode Hydrogen is conceived as a drum machine, while in Piano mode it is a sort of general synthesizer used through a common music keyboard. Adding to these powerful features, Hydrogen comprises a sound editing GUI to make changes to your samples. The Sample Editor GUI with three sections explained down. If compared with other professional, or not, sound editors, this one integrated with Hydrogen is too much essential but adequate to work rapidly on a sample or to extrapolate a new loop by a more lenght sample. The GUI has three sections: one for the sample visualization (1), another dedicated to time modification but without altering the frequency (2), and finally a third for previewing the final result. The last GUI is that of Mixer which is a classical mixer, so with fader, knobs, Mute and Solo buttons, and so on. Through the Mixer we can regulate every parameter for each sample. We can not forget that Hydrogen is equipped with a large loop library, that you can download for free by clicking here. There is also a practical little manual that you can read easily so to have a good familiarity with the software. Furthermore on the official site you can find many video tutorials, to start using it immediately. In general the official site is quite interesting, there are also contests to vote the best users drum kits. Hydrogen is certainly a excellent virtual drum machine, as turned out by the others similar projects which used loop samples realized with Hydrogen. What do you think? What is your best virtual drum machine? It’s really decent but horribly unstable. Avoid. You say? To me it never gave any problems! Also allows import of .flac files which has allowed me to extend to be an incredibly powerful sequencer. I use it on almost every project. You’re right! Thanks for your posting, Will! Hi Eddie, thanks for your comment. No, Hydrogen cannot export mp3 files. Hydrogen exports only these formats: wav, aiff, flac and ogg. Does it work on Mac OS? Does it compare to the paid drum machine softwares? Can you export the drum track and import it to audacity? Does it also work with Sonar LE ? Hi Daniel! Yes, I think so! For other reasons, some week ago I read this Q&A: http://www.hydrogen-music.org/hcms/node/1090 It seems to me look like to your question! Is this compatible with ProTools?